Have a look around your home, workplace or school. Hardly a day goes by that we don't touch wood in some form or other (furniture, joinery, musical instrument, sports goods, paper and so on). Consumers have the power to change the world by insisting on the best possible environmental standards when it comes to purchasing timber and wood-based products. Always look for the FSC logo on wood-based products. It is a guarantee for the discerning wood product consumer that yoir purchase comes from forests managed to the highes standards in the world. Are you an Ethical Consumer? Click here to find out! The Best Ever Explanation of Why You Should Buy FSC Wood. FSC Canada recently issued the FSC Story, in what Treehugger.com calls "the best ever explanation of why you should buy FSC wood." Created by Franke James, the story takes viewers on a journey through the forest and explores what each and every one of us can do to ensure that we have healthy forests and strong communities for generations to come. Globalization has made consumers powerful actors in our world economy. Our daily choices as consumers affect the lives of workers in distant places and the way people live. Wood is a great example of how local purchases can have either a positive or negative impact on peoples lives globally. Sustainable consumption means buying goods and services that do not harm the environment, society, and the economy. Wood impacts our lives in so many ways: When we buy timber and wood-based products we rarely think for a moment of the country of origin. Nor do we think if our purchases have a negative or positive effect on the forests from which our timber and wood comes from. Just CONSUMERS is a way of guiding you to ask for timber and wood-based product from responsibly-managed forests. 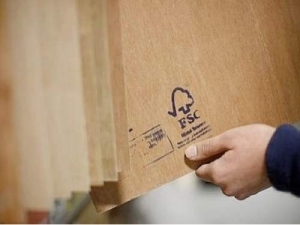 Look for the FSC logo next time you buy timber and wood-based products, such as paper, panelboard, furniture and joinery. For more on the Forest Stewardship Council (FSC) please click on the image to your right or view this lovely video by renowned Canadian writer Franke James.